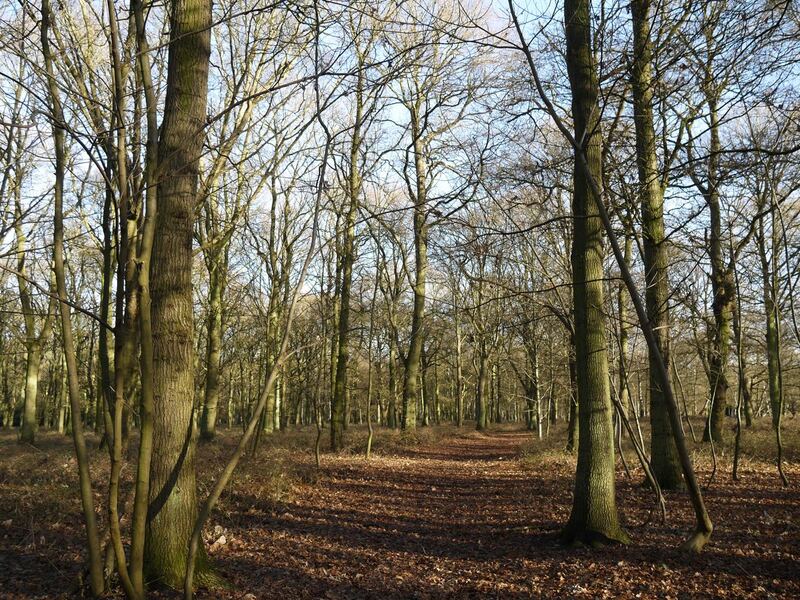 On a map, Epping Lower Forest has never seemed too appealing – separated from the main body of Epping Forest by the town of Epping, I’ve bypassed it on the way out to Harlow but never walked its glades. In that quiet week between Christmas and New Year I set out from Epping towards Ongar and stepped off Epping Road into the Lower Forest for the first time. E.N Buxton, writing in 1884, describes it as a “pretty wood”, where, “a summer’s afternoon may be well devoted to its exploration; I say summer advisedly, as parts of it lie low and swampy”. It was fortunate for me that despite approaching midday the ground was still mostly frozen, the deep muddy trenches of footpaths solid glistening white, so walking was more like clambering across rocky ground. A man walking his dog told me of a herd of 40 or 50 deer his mournful looking hound had just scattered, ‘if you keep your eye out on the far side you may see them re-gathering’. And sure enough, as I munched my M&S Turkey sandwich on the Stump Road I became aware of being watched silently by a small cluster of grey deer. It was magical. The planes from North Weald Airfield had regularly passed loudly above the treetops and that was where I was heading next. An important fighter station during WW2, and still a busy civilian airfield with small planes buzzing off all over the country, there is a campaign to save the site as the threat of development looms. 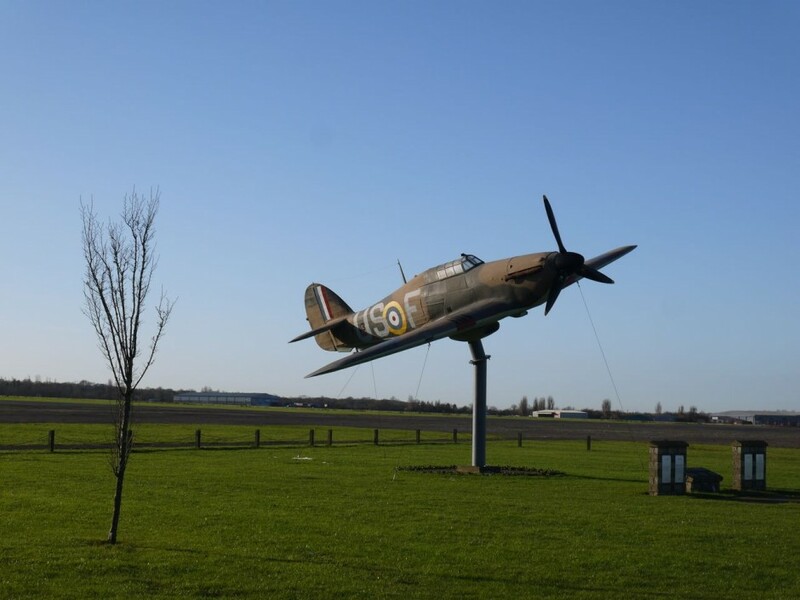 An iconic Hurricane fighter plane stands guard at the front gate. The security guards let me come in for a wander round to soak up the atmosphere and feel the wind whipping in across the runway. 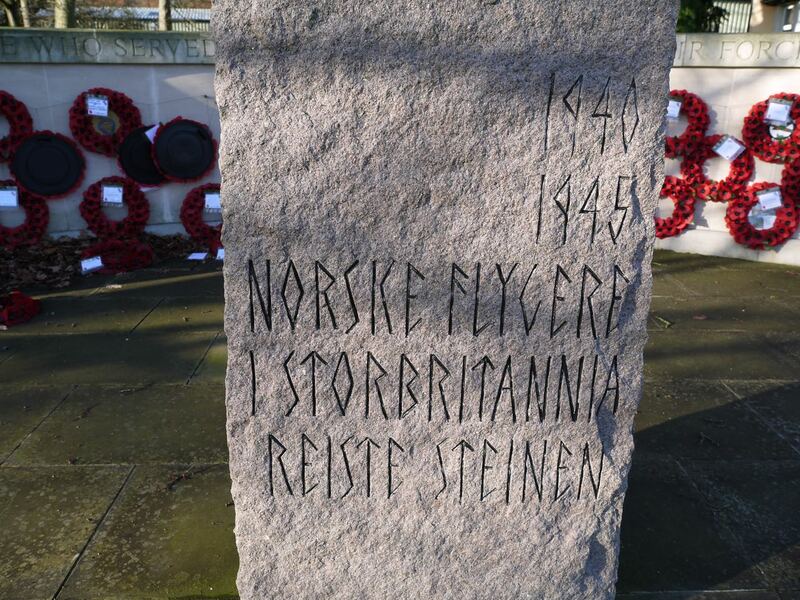 Pilots for 7 countries flew from RAF North Weald during the Second World War, the memorial near main road has a carved stone tablet dedicated to the Norwegian airmen who lost their lives. 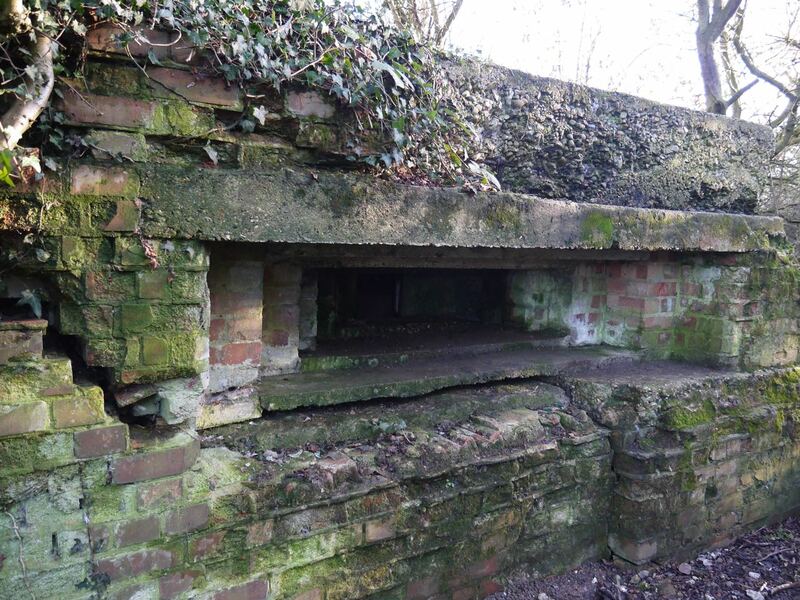 Following a tarmac path into a thicket across the road there’s a pillbox peeking out from the dense undergrowth. The narrow tunnelled entrance is littered with the usual detritus of the suburban fringe. Lords knows what you’d find inside. Moving across the fields on the far side of North Weald Bassett I now kick myself for virtually walking straight past North Weald Redoubt Fort, part of the late Victorian defences of London and now beloved of urbexers and ghosthunters. I cross the disused section of the Central Line near Ongar Park Lodge heading into the last light and dash back down the farm track to see the last steam train of the day chugging along the line back to Epping. A sign on the gate warns that a bull with a pregnant cow is in the field although I’m reassured by the couple in the Lodge that they’re elsewhere. Entering a narrow strip of woodland by the field edge I see movement on the other side of the tree line – a man holding a bird, a shooter with his kill I assume. But as I move towards him for a chat I see that the bird is very much alive and standing proudly upon his arm. He tells me it’s a Harris Hawk, a hunting bird, that he’s been exercising out above the fields. The rabbit leg it methodically tears apart with its yellow hooked beak was acquired from a butchers rather than a burrow. It’s a majestic beast. 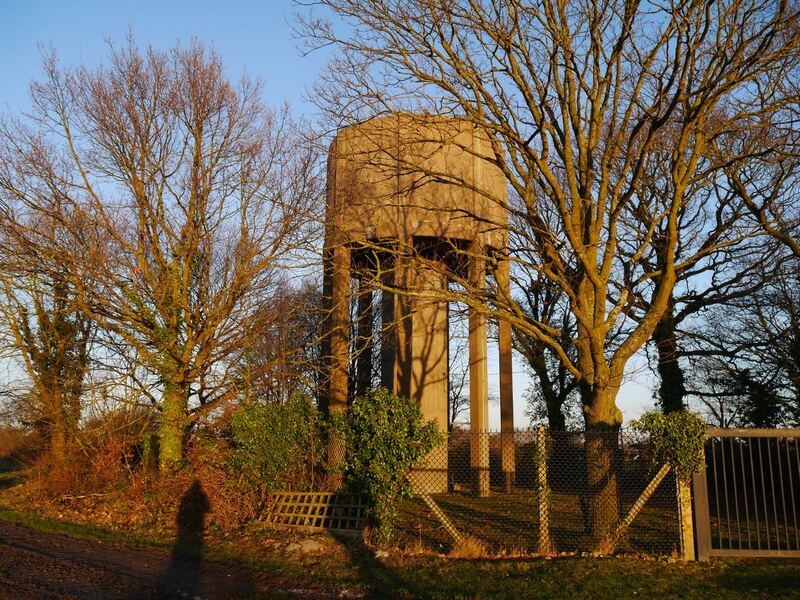 We walk together down through the wood, the three of us, to the water tower at Toot Hill where we part company. The walk isn’t to last much longer, cut short by a deep irrigation ditch carved across a field cutting me off from the continuation of the footpath. 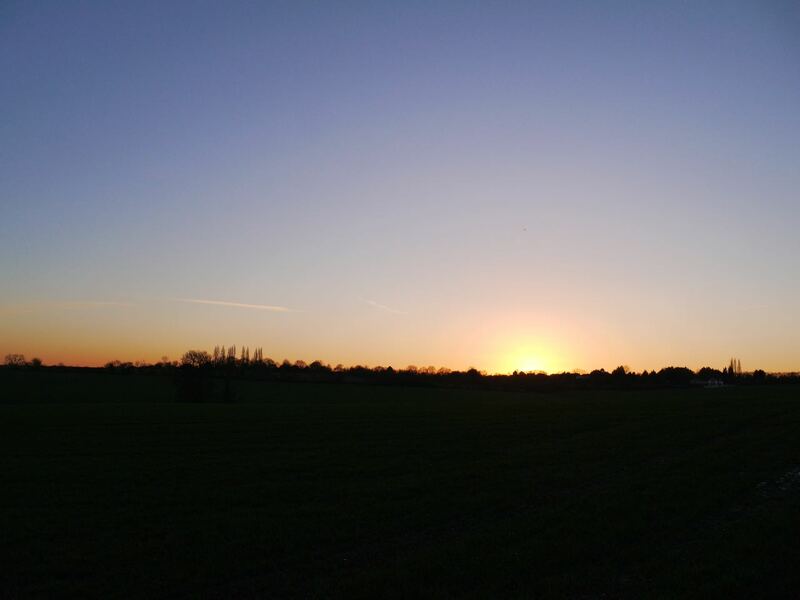 Climbing up through deep mud to the high ground at Greensted, boots caked in mud, I catch the most resplendent sunset breaking over the facing hill and know that 2018 will bring a year of great walks.